Blue Papillon (hull No. 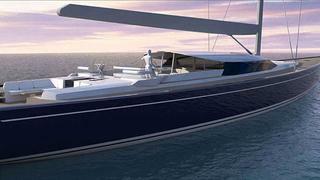 391) was launched by Royal Huisman last week. This elegant sailing yacht was ordered at the end of 2010 with Burgess involved as owners' representative. Blue Papillon is a 43.31m all-aluminium sailing yacht designed by German Frers. She’s a contemporary but ageless sloop with a low-profile deckhouse. The contemporary interior, designed by Rhoades Young, accommodates eight guests in a full-beam master suite, a double, a twin and a convertible cabin. The owners' cabin has direct access to the aft deck, which is organised as a beach club. Blue Papillon was transferred to Harlingen where she will start her sea trials. Scheduled to be presented to the press during the upcoming HISWA tour, it will give us the opportunity to provide more details soon.